An eight week week-by-week preparation schedule. Guidance on how to prepare your adult and student retreat leaders. A sample retreat schedule that you can work from to build the retreat that works for your school. Clear breakdowns of the various talks and meditations of a Kairos retreat along with suggested follow-ups. 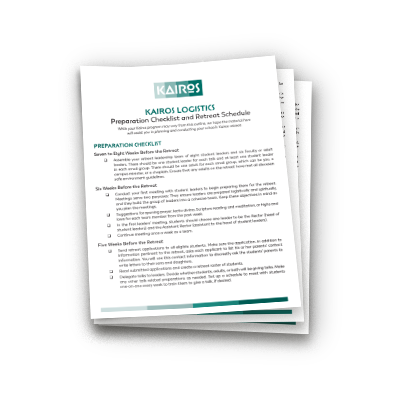 Click the button below to get your copy of the Kairos Logistics Checklist.